There isn’t much that makes me smile more than good food. Well, maybe good food and free stuff! 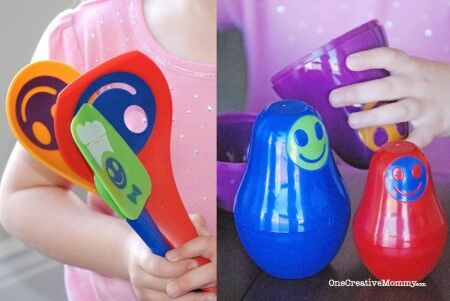 Today I’m partnering with Kizmos to make your good food even more fun! 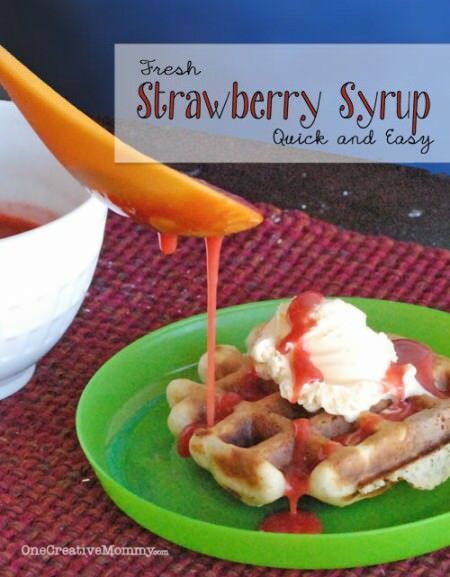 I’ll be sharing a super easy recipe for Fresh Strawberry Syrup (we’re talking . . . two ingredients and a blender, easy) and giving you a chance to win some “happy” kitchen gadgets. First the recipe, then the gadgets. Don’t blink, or you’ll miss the recipe. It’s really easy and incredibly quick. Ready for this? 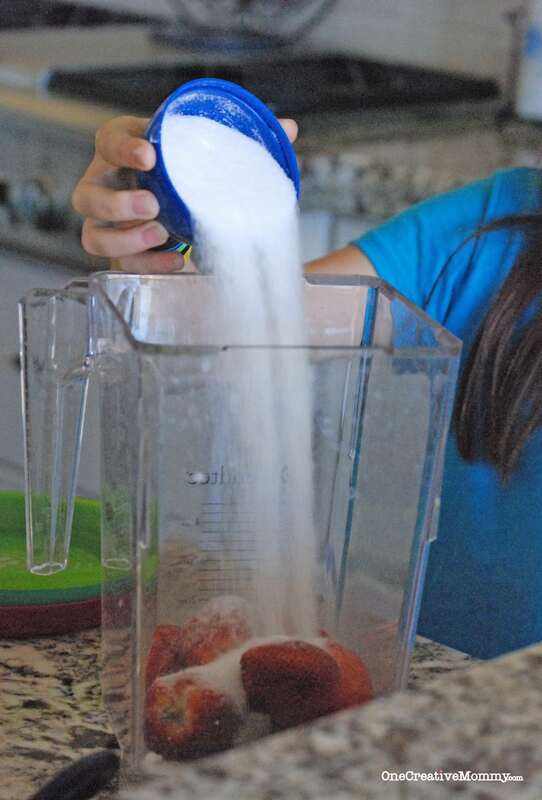 Wash the strawberries and plop them into the blender. (If you have a Blendtec, you don’t have to cut them or anything.) Add the sugar. Blend until you have a deliciously red syrup. (For the Blendtec, just press the soup button.) Drizzle over your favorite ice cream, cheesecake, pancakes, waffles, french toast . . . you get the idea. Does it get any easier than that? Now for the gadgets! Kizmos products just make me happy! I love the fun colors and giant smiley faces. My kiddos have been super excited to try out these happy tools, so I decided to let them help me with the cooking. We took everything over to Grandma and Grandpa’s and made them a five-star breakfast (at lunch time)! Something about cooking and serving with a literal smile makes the job just a little bit more fun! So, do you want to win some kitchen gadgets? Kizmos is offering everything they sent to me to one lucky reader. Good luck, and enjoy your strawberry syrup! Click here to see the places where I have been known to link up my projects and recipes. First, that Strawberry Syrup looks delish! YUM!!! Second, those Kizmos are adorable!!! So cute!! Third, I wanted you to know that I am having a link-up on Fibro, Fit and Fab! that gives you a chance to highlight your friends, and today, you are one of the friends I chose to highlight. :) You have always been such an encouragement and a good friend. Thank you for all you do! wow! I have never seen those before! Party starts tomorrow at 7:05 pm eastern time! Hope to see you there! Thanks for sharing at What’d You Do This Weekend. I love simple and springy ideas like this! Hope you can join us tomorrow. brain dead visitors? :-P And, if you are writing at other places, I’d like to keep up with you. Could you make a list of the complete urls of your social community pages like your twitter feed, Facebook page or linkedin profile? same topics discussed in this article? I’d really love to be a part of group where I can get responses from other knowledgeable individuals that share the same interest. If you have any recommendations, please let me know. Thanks! for a paid option? There are so many choices out there that I’m completely confused .. Any ideas? Thanks a lot! I wouldn’t mind publishing a post or elaborating on a number of the subjects you write concerning here. Again, awesome website!